The right tool for the work at hand! A close look at this Red Crossbill reveals a curious adaptation. The long tips of the upper and lower bill don't meet, but instead cross over each other. The bills of young birds are not crossed at hatching, but cross as they grow. 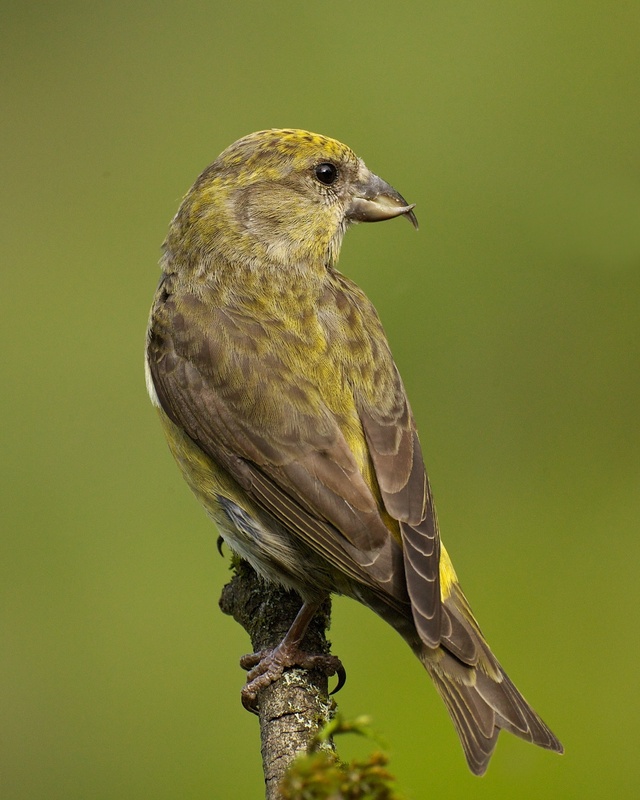 The Red Crossbill bites between the scales of a cone and pries them apart by opening its bill, then dislodges the seed with its tongue. Be sure to watch the video! This April BirdNote listeners are going on a spring migration adventure in the Texas Hill Country — and you can join us! Trip details and more at at Birdnote.org. That’s the sound of a Red Crossbill. 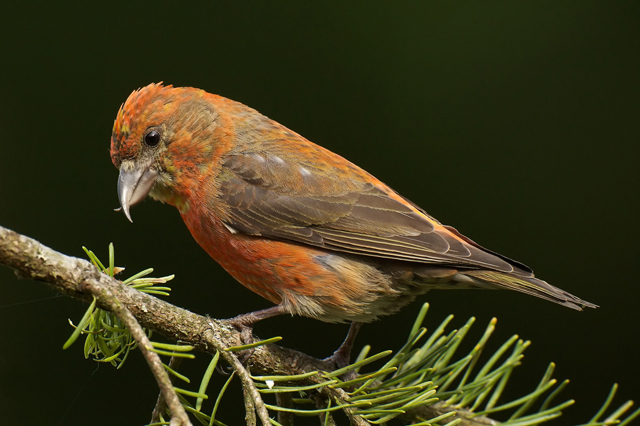 Crossbills travel in a small flock in search of seeds from the cones of pines, spruces, and firs. How they obtain those seeds involves a curious adaptation of their bills. First, cross your fingers, like one does for good luck. Now, just like your finger tips, the long tips of the Crossbill’s upper and lower bill don’t meet, but instead cross over each other. To feed, the bird first detaches a cone from a conifer and holds that cone parallel to the branch with its feet. The bird then bites between the scales of the cone and pries them apart by opening its carefully crafted bill. Holding the scales apart, the bird then dislodges the seed with its tongue. Red Crossbills search for cones on the tops of the trees, climbing around using their feet and bills, much like parrots. And strangely, they’ll breed in winter, if the cone crop is good enough. Call of the Red Crossbill provided by The Macaulay Library of Natural Sounds at the Cornell Lab of Ornithology, Ithaca, New York. Recorded by G.A. Keller.